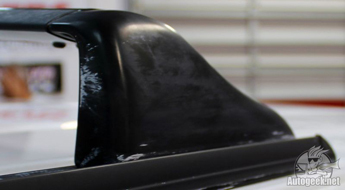 Auto Trim & Molding Guide: clean & protect exterior vinyl, rubber, and plastic trim and bumpers. 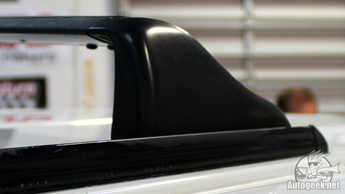 In recent years, black plastic trim has become popular among auto manufacturers – think of the Nissan XTerra, the Hummer H2, and the Jeep Wrangler. All these vehicles have two things in common: #1 they have black molding either over the wheels or on the front, or both; #2 they’re rugged, off-roading vehicles that incur more abuse than your average sedan. For these two reasons, you have to apply protectant to these pieces. If you don’t, they’ll turn gray faster than you can say “low resale value”. This tutorial will make some suggestions on how best to keep your dark trim and moldings looking like new. Wash the trim and moldings each time you wash your vehicle. On textured pieces, use a Pinnacle Detailing Brush found in the Pinnacle Detailing Brush Kit. For larger pieces of trim, you might find it easier to use the 8 Inch Montana Orginal Boar's Hair Wheel Brush. A brush will allow you to pull contaminants out of the pores of the material. These contaminants may be contributing to the discoloration of the rubber or plastic. Avoid using stiff bristle brushes on smooth black plastic; it will scratch. If you already have a dressing on the trim and molding, clean it off periodically. Layering dressings will eventually result in discoloration because the outermost layers are not curing to the rubber; they are just sitting on top of old layers. Take a moment to clean off old dressings at least every two months using McKee's 37 Wax Remover for Plastic. Spray your microfiber towel. and wipe down the trim pieces to avoid overspray. This product excels at removing dried-on wax and polish residue, especially from pebble-textured plastic trim. Once your vehicle is clean and dried, you need to protect the trim pieces with a quality rubber, vinyl, and plastic protectant. This will help prevent future UV degradation, which is the primary cause of fading. Wolfgang Exterior Trim Sealant and 303 Aerospace Protectant are both exceptional products. They both provide excellent UV protection, but 303 Aerospace Protect is very natural-looking. Wolfgang Exterior Trim Sealant darkens, enhances, and protects plastic and rubber trim. It also protects metal trim and gives it a clear, glossy finish. Use a microfiber applicator pad to spread the protectant over the surface. It will provide an even coat without dripping or running. 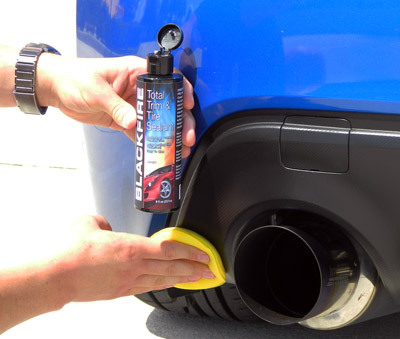 I apply protectant to my vehicles once a month because the sun is intense in Florida, but once every two months is probably sufficient in most climates. When applying protectant, don’t skip the wiper cowl (the plastic piece at the bottom of the windshield), the mirrors (if applicable), and window and door moldings. Use a detailing swab to apply protectant in tight spaces. Open your doors and apply protectant to the rubber gaskets, too. If they become dry or brittle, they will not effectively keep out air and road noise. Vinylex Quick Wipes by Lexol are a convenient way to protect and preserve rubber gaskets. Just use a pre-moistened wipe to apply a layer of patented protection. If your black trim and molding have already faded, there are options to restore them. Black WOW is a clear restorative coating that works on any color exterior trim. It is not a dye! 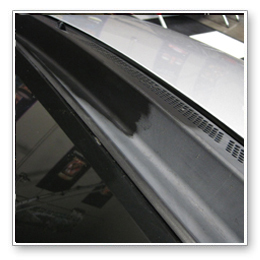 Black WOW is a clear, matte finish trim restorer for all smooth and lightly textured trim. 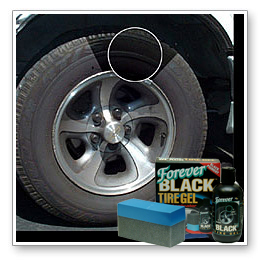 Another option is BLACKFIRE Total Trim & Tire Sealant. This thick, gel-like formula penetrates deep into the pores of plastic, rubber, and vinyl exterior trim, restoring the finish to factory-new condition. A traditional trim dressing might last a week or two if you’re lucky; BLACKFIRE Total Trim & Tire Sealant provides MONTHS of durable protection. Use it on tires as a long-lasting, waterproof dressing! This polymer-based trim restorer forms a bond at the molecular level, restoring the surface while coating it in a durable, protective shell. BLACKFIRE Total Trim & Tire Sealant doesn’t wash off in the rain – it actually causes water to bead up like a wax! Forever Black is a black dye for coarse rubber and plastic pieces. The dye contains UV protectants to prevent future fading and its polymer formula ensures lasting color. Forever Black is a permanent dye so use care when applying it. In fact, test it out on an inconspicuous area before applying to all the trim. Keep in mind that it will not be able to absorb evenly into smooth plastic. Forever Black is intended for textured plastics. The Forever Black Bumper & Trim Dye Kit comes with a cleaner and a bottle of dye. The dye has a sponge-tip right on the bottle for easy application. Turn the bottle upside down and press it against something to get the dye flowing. Spread a thin, even coat over the surface and allow it to dry for 20 minutes. No buffing is required. It may take a couple of coats to get the desired shade of black. 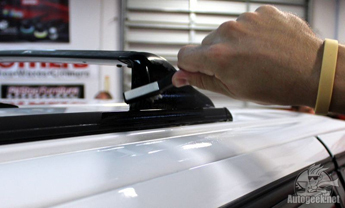 If your trim isn’t quite black or you have smooth plastic surfaces, another option is Black WOW Trim Restorer.This is a long-lasting product that significantly darkens the color of the plastic or rubber. It takes very little Black WOW to get great results. Start with a pea-sized amount on a foam applicator and spread it as far as it will go. If you have a black plastic license plate frame, it will benefit from a coat of protectant, too. Use a detailing swab or the corner of your microfiber applicator to apply a thin coat. For frames that contain a clear plastic lens, clean and protect it with McKee's 37 Plex-All™ to prevent yellowing.